"Let the people be happy with self sufficient food grown in the field with milk products. "When I was in Frankfurt round our place I was so happy so see the farms and the cows. Unfortunately they will kill the cows. So if we organize a farm without killing any cows, that will be a great example in that country. Instead of killing cows, if we let them live, we can get so many nutritious foodstuffs filled with vitamins. 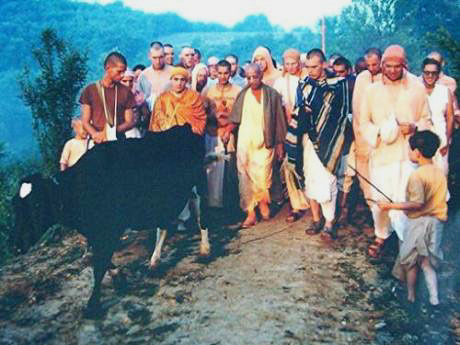 "I have seen in New Vrindaban how happily our devotees are living there with free air, fresh vegetables, and ample milk. Simple living in cottages. What you want more? We should not neglect the upkeep of the body, and we should save time to chant Hare Krsna. This mission should be propagated. Save time and chant Hare Krsna."